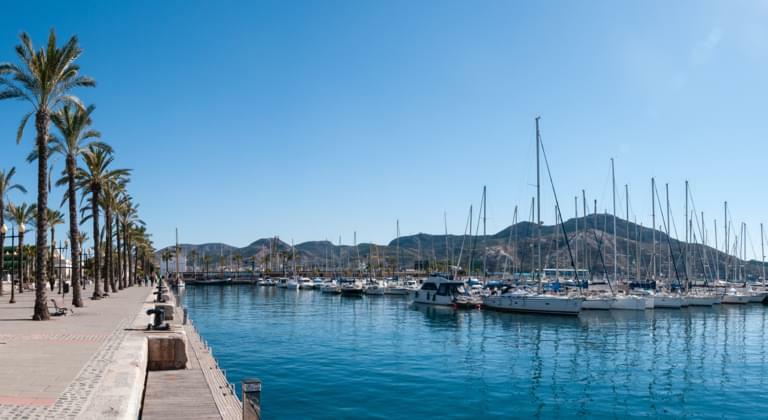 Explore Spain Murcia is a university town in south-east Spain with a dry climate that attracts holidaymakers all year round and is a good starting point with a rental car. With 440,000 inhabitants, Murcia is one of the largest metropolises of the Iberian Peninsula. It lies on the banks of the Rio Segura and offers numerous historical sites. From Germany you can reach the city within a few hours by plane. You will land at Murcia San Javier International Airport with the IATA code MJV. The airport is also used by the Spanish Air Force and is located 42 km southeast of the metropolis. Each car rental is located at the very modern airport in its own car rental center. However, you should rent a car cheaply before departure online on our portal for transparent car rental comparison. You can rent a vehicle in each class comparatively cheaply from us and add the desired extras when booking. The rental car awaits you on arrival at your preferred car rental company and you will find yourself on the RM19 in the direction of Murcia shortly after handover. The following examples will give you an idea of what you can discover there. The cathedral of the regional capital is an architectural masterpiece, which successfully combines different architectural styles. Situated at the Plaza Cardinal Belluga, the building is easily accessible by rental car thanks to good signage. After visiting the nearby Bishop's Palace, you could walk to the Rio Segura at the Plaza Glorieta. It is pointless to drive there in view of the many closed roads. Leave your rental car at the cathedral, as the city centre is largely designed as a pedestrian zone. During a walk you will also see much more of the magnificent buildings. Especially worth seeing is the casino, whose courtyard reminds of the Alhambra of Granada. In addition, numerous restaurants in the old town offer regional specialities and afterwards the riverside promenade is ideal for relaxation. The surroundings of the city puts the most diverse excursion destinations in option. You could rent a car and visit the old port city of Cartagena and the Roman theatre. The Costa Calida is ideal for swimming or water sports. The Nature Park Sierras de Cazorla offers you varied landscapes for eventful hikes . It is located in the north-east of Murcia and can be reached by various roads. Ask the Murcia airport car rental for information on other destinations in the area. Our portal shows you clearly every car rental company in Murcia, Spain. You can use our search function to compare the rental car offers of each company and check the availability of accessories or relevant services. As a result, you can comfortably rent a suitably equipped car in your own four walls at an extremely favourable price and, by making a reservation, go relaxed to the Murcia airport car rental. The rental car is waiting for you as booked and the few formalities are quickly completed. Renting a car spontaneously at the airport usually leads to disappointments, because more and more holidaymakers book their vehicles comfortably on the Internet. Given the simple and effective approach, the development is only natural. However, there are some criteria to consider when booking and renting a car. Experts and experienced car rental users recommend fully comprehensive insurance without excess , because this efficiently avoids unwanted additional costs. If, however, you choose a policy with a deductible, you pay the costs proportionately in the event of an accident. Because a rental car insurance is personalized, only protects you as the policyholder, any possible additional driver from the car rental company must be integrated into the contract. This means that accident damage caused by the second driver is also covered by the insurance company. You decide at which airport you want to pick up and drop off the rental car. If you would like to reach other Spanish destinations such as Barcelona cheaply from Murcia Airport, select the one-way rental and specify the desired departure airport. Car rental remains the same at both airports. Each car rental blocks the deposit on your credit card before the vehicle is handed over. You cannot dispose of the contract during the entire rental period. Only when the car is back with the landlord, the sum is available. Therefore, it is important to have enough space on the map. On the traffic regulations side, car rental in and around Murcia is no challenge at all. The regulations are almost the same as in Europe, only you have to watch out for the yellow marked road edges. Yellow generally means no parking and blue marks allow paid parking. It is advisable to ask the car rental company for information on Spanish-labelled traffic signs when you pick up your rental car. Otherwise, a defensive driving behaviour that complies with the rules is advantageous. Stay calm during police checks and pay fines immediately or within two weeks.